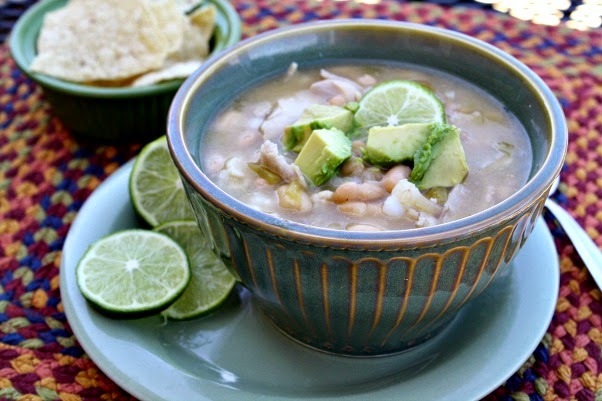 This comforting White Bean Chicken Chili comes together with minimal ingredients and under 30 minutes! Serve with a variety of tasty toppings for additional flavor. Winter is officially over and our North Texas weather is finally changing over into more spring like temperatures. This month we've had a mix of weather patterns everything from snow, sleet, ice, freezing rain, fog to torrential downpours. This weekend the sun is finally making an appearance after 6 long weeks! I'm definitely ready for more spring like temps. With all the cold-wet weather we have pretty much stayed indoors and hibernated for the most part. I've been cooking up a storm and preparing all of our favorite comfort foods, chicken and noodles, homemade soup. chicken stew, and chili. We've actually enjoyed chili twice over the last month. One was was a regular red based ground beef chili and the second variety was a White Bean Chicken Chili! My husband prefers a red based chili with ground beef or ground venison, but I love both. I can't believe this was my first attempt at making a white chicken chili. All I can say it that I sure have been missing out. 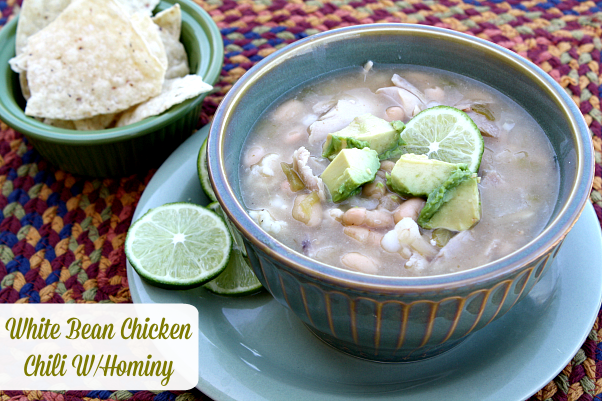 This white chicken chili was super simple, super quick, and came together in about 30 minutes. Definitely my kind of recipe! I use canned beans in all my chili recipes because they're a huge time saver. For this recipe I substituted Bush's new Great Northern Beans Chili Beans with a mild white chili sauce for regular canned great norther beans. The flavor combination was wonderful and perfectly seasoned with garlic, cumin and onion. 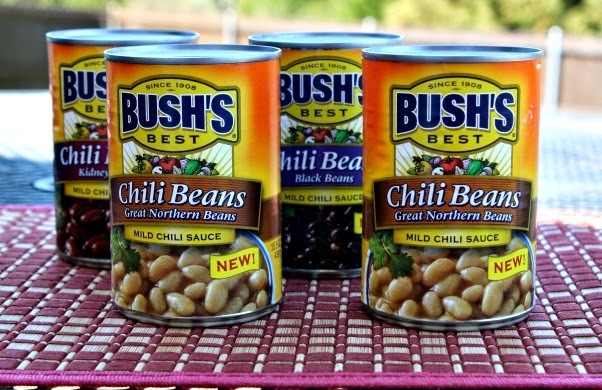 I've been using Bush's Chili Pinto Beans for as long as I can remember, so I was excited to see Bush's New Chili Bean Varieties to include three new flavors: Black Beans with Mild Sauce, Kidney Beans with Mild Sauce, and Northern Beans with a Mild White Chili Sauce. All of these new chili bean varieties open the door for so many recipe possibilities. By using these new chili bean flavors it eliminates the need for additional ingredients and spices. If you prefer more of a creamy texture to your white bean chicken chili, puree one can of the great northern chili beans part way before adding. I hope you enjoy the recipe and don't forget all the yummy toppings. My favorites are, avocados, lime juice, queso quesadilla cheese, and cilantro. My store was out of cilantro, so it isn't pictured. Optional Toppings: tortilla chips, diced avocados, fresh lime juice, cilantro, jalapenos, sour cream and shredded monterey or queso quesadilla cheese. In a large stock pot, cook onion in oil for 4 minutes or until onions are transparent, Add green chili's, flour, and cumin; cook and stir for an additional 2 minutes. 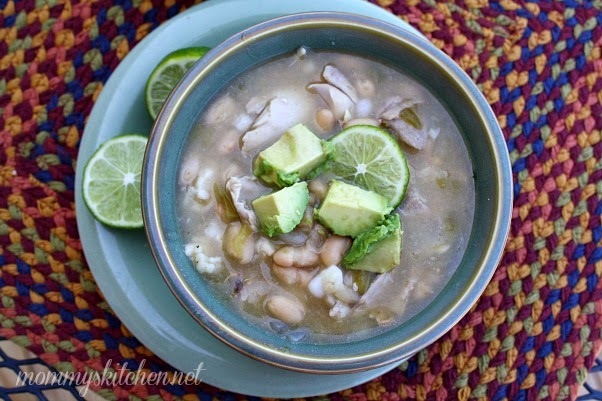 Add the chicken broth, salsa verde, pepper, hominy, northern chili beans, and cooked chicken. Reduce heat; simmer for 20 minutes or until slightly thickened. Garnish with optional toppings of your choice. Serve with corn tortillas or cornbread. Cook's Note: To give this chili a creamy texture puree one can of the great northern chili beans before adding. I also wanted to note that I prefer to use a combination of chicken thighs and breasts for this recipe. Disclosure: This is a #sponsored post on behalf of Bush's Beans. I have been compensated for my time and efforts in creating this post, but all opinions are my own. Thanks for share. I really excited to read this blog. I am also from chef background and love to enjoy reading and learning new things. Is it OK to use rotisserie chicken.